Standing in the middle of a well-stocked book store may seem like the moment you would least need access to Amazon.com. But I can’t count how many times I’ve been in a store, picked up a book and wondered how much it costs on the online retail site. There’s also the matter of reviews—a quick glance at the write-ups on Amazon.com can give you more info on whether the book you might buy is as good as a read as it promises to be. 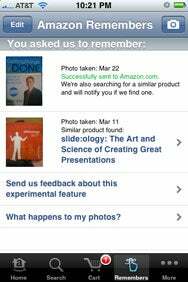 Try to Remember: Amazon Mobile’s Amazon Remembers features is great for getting more information on an item simply by taking its photo. Sure, you could always hop on the mobile version of Amazon.com via the built-in browser on your iPhone or iPod touch. But a well-designed native app is hard to beat. And the free Amazon Mobile from Amazon.com is a well-designed native app. Amazon Mobile is pretty simple: Search for items you’re interested in and click through results to reveal just about all the details you’d find if you performed a similar search on the Amazon.com Web site. You can buy and add items to a cart without even opening your browser. While it’s not critical to have an Amazon account to use Amazon Mobile, it definitely helps if you want to use some of the cooler features of the app. For instance, if you’re logged into your Amazon account, you can add items to your wish list—pretty handy if you just want to add something to your list for a possible future purchase. One of the app’s coolest features is the Amazon Remembers feature. Simply take a picture of a book or another item you’d like to remember, and Amazon Remembers looks up the item and provides details about it. (Because the feature requires use of a camera, only iPhone users can take advantage of Amazon Remembers.) This is an absolute time saver for those times when you simply want to take note of an item in a store you might be interested in purchasing later. The Amazon Mobile app is more than just a way to buy stuff through Amazon. With access to all the details of items sold on Amazon, wish lists, and the Remembers feature, Amazon Mobile is one of those apps that you’ll find yourself turning to just about every time you go shopping. Amazon Mobile is compatible with any iPhone or iPod touch running the iPhone 2.x software update.